X-Small - €31.99 Only 7 left! Small - €31.99 Large - €33.99 Only 3 left! When anyone wants to gear up for some villain activity, there are a number of go-to outfit choices. A ton of them vary fairly widely, especially based on the bad guy’s setting, any particular powers or equipment that they might utilize, or occasionally what protagonist that they might face. One pattern emerges, however, and it is the fool villain that ignores adhering. Of course, we’re talking about a costume of dark contrast! You might be the wicked cowboy that rides into the Old West town, bandits camped out and ready to lay claim to the wealth of the city while they watch for you in your wide-brimmed and dark, black hat and glimmering silver buckle. Perhaps you’re the 1920s gangster, the Don of the mob family who receives virtual dignitary meetings with local government officials, all while glad in your stark black suit with your glistening white wingtip features. They key is black contrast, would-be dark souled villain! Of course, the best example that anyone might call upon is the mighty Sith Lord, himself, Darth Vader, whose entire form is like obtenebration thanks to the stark helm and storming black cape. And we have just the thing for any one who might wish to walk in the same path as the second-hand to the Emperor. 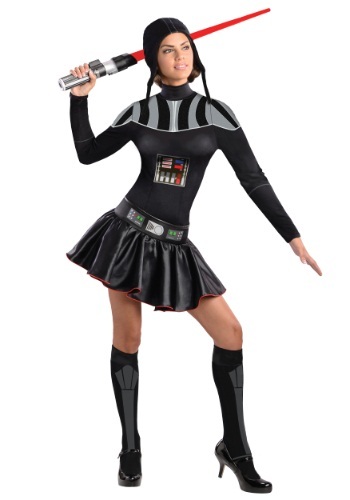 Such a daunting role belongs to anyone willing to walk the Dark Side, which is where this Adult Darth Vader Dress costume comes into play. The black dress and skirt is made of comfy polyester with silver printed buttons and detailing… not to mention threads of darkness itself! The matching black stockings have gray detailing representing the elder Skywalker’s armor and the knit stocking cap will give you the helmet look without the helmet hair! Join the look with a red lightsaber and optional telekinetic powers and you’ll be conquering all at your Halloween festivities.